Huge indoors and outdoors, 7 bedrooms, 4 bathrooms, cosy and calm. Discounted prices apply for stays of 3 nights or more! Feel free to ask. Aynadamar is a 595 m2 villa, with 3 big living rooms all connected to the indoor garden: the winter living room, with a fire-place; the summer living room with large terraces and stunning views to enjoy summer nights and the games room with a billiard table; all together are a perfect place to enjoy with family and friends. The villa has 7 rooms, 4 bathrooms, 1 toilet, a large fully equipped kitchen and a library. The enormous swimming pool is in a big garden separate of the house. There is also a tree walk where you can see beautiful sunsets, and a place to play petanque. What to do in the area! I love sharing the property with the guests that visit us from all over the world. I like to meet them upon arrival to confirm that the property meets its expectations and to ensure they have everything they need. It is a very special property. The property was designed by my parents to enjoy with family and friends. As it is quite big, I recommend it for groups from 8 to 17 people. Is a really nice place to enjoy with group. At any time of the year, the area has many interesting things to do. In winter, we enjoy the sky resort of Sierra Nevada (at only 50 minutes). In summer, we like to go to the beach. And every moment is a good moment to visit Granada. The property has amazing views of Granada. Its location is an strength, because it is a perfect combination between relax and experiences. The property has a huge private pool of 106 squares meters. Aynadamer Villa is a delightful property ,very spacious with fantastic views. The rooms are very clean and comfortable. Ideally situated for visiting Granada , Alhambra Palace and the Sierra Nevada mountains. We enjoyed the short walk to the beautiful hillside village of Viznar. Our stay was a very enjoyable and we would highly recommend this Villa. It has been a pleasure hosting you and your nice group of friends. I'm very happy you have enjoyed the area and the villa. All the best for you and your friends. The owner met us in the nearby village to make sure that we got to the property, which was a great help as it is tucked away down a dirt road, and then went through the house in detail so that we knew where everything was. The large safety deposit was a bit of a shock and it would have been good to know the amount before hand as we didn't have enough cash but we were able to pay on our card. We enjoyed eating together every night on the terrace watching the amazing sunsets. We also appreciated having pool towels provided and the welcome bread baskets. We spent most of the week enjoying the pool but the location is within walking distance to a couple of bars and only 15 mins away from Granada by car so great for exploring the city. You can see and hear the dual carriageway from the house but it is not intrusive. Good wifi and smart TV so our teenagers were happy too. Thanks Patricia for letting us stay in your wonderful house. Thank you for your comment. We are glad to see that you have enjoyed your stay at the villa. It is a pleasure to host large families and to see that all members (adults, teenagers and children) enjoy the area and the different entertainments offered by the Villa). Regarding the deposit, the amount it is specified in the payment details when booking. I usually remind the guests about the cash security deposit a few days prior the arrival, but maybe I've forgotten this time. I'm sorry about that. The guest can choose to pay the deposit can by cash or through HomeAway website and it can be paid in any currency. We have noted that in some occasions the amount required can be considered a large amount, thus we have taken the decision to reduce it for future guests. We arrived on 6th August at 11.00am and the villa was ready for us, having liaised with Patricia beforehand about our early arrival. The villa is very spacious and is well equipped, especially the kitchen. There are numerous 'breakables', which we made sure we moved out of the way at the beginning due to having six children with us (sorry Patricia, never got around to putting them all back where they belong). The rooms were more then adequate and there are fans to compensate for the lack of aircon. The veranda area is great for evening meals and drinks and we were even treated to a couple of firework displays in the distance overlooking Granada. Plenty of shooting stars as well. We found the best part of the villa to be the pool area. Massive pool and plenty space for the kids to mess about. Beware the sprinklers at 2.00pm though, bit of a shock to the system of they cath you unawares! The walk into Viznar village takes 15-20 minutes, but for those less mobile, the hill at the end can be a bit arduous. Florida bar in the village is spot on, basic, but does a job. Kiosk bar in the village is good for the kids with a playground, but check the opening times. There is a small shop in the village, but this is very hit and miss in terms of opening times. There is a bus stop by the Kiosk bar that takes you into Alfacar and then Granada. Alfacar has a supermarket, bank and a few restaurants and bars. This is a 30 min walk from the villa, but again, beware the hills. Cars are not essential, but I would certainly recommend if only to assist with shopping runs. Patricia sorted out car hire for us for a few days, which worked out a lot cheaper then the quotes we received when walking into enterprise / Europcar in Granada. All in all, a cracking holiday and will be returning some time in the future. This summer it has been a challenge as we have been full (mainly families from UK and Ireland) and it is very rewarding to see that the villa and the area fulfilled yours and theirs expectations. Sorry for the sprinklers. For other previous guests that will sound familiar too. We have had a problem with the clocks that switch them on, but I think that we have finally sorted it out. Thank you for delivering the house so clean. Amazing house and facilities with a view you never get tired of! We stayed here as a family of 14. The property is a very high standard with large bedrooms spaced out on various levels so you never felt like you were on top of each other. The pool is great with a nice grass area next to it which all the children loved. We would definitely recommend this property for a summer family holiday and Patricia the owner was very helpful and replied very quickly to any questions. We love hosting families with children. Thus is very grateful for us to know that all the family, children and adults, have enjoyed the stay. This is a beautiful, spacious villa inside and out, perfect for sharing with family and friends. It provides areas of sun and shade at all times of the day. The grounds are vast so lots of space for activities and the pool is a good size to accommodate large parties. The Villa is designed to stay cool, all the bedrooms have fans, and even though we had temperatures in the mid 30's during our stay we were never too hot. The villa was comfortable,clean and well equipped with everything you could wish for. We particularly enjoyed eating and drinking outside in the evenings absorbing the stunning views and spectacular sunsets. We also recommend walking into Viznar village buying bread from the local bakery and sampling the hospitality of the local tapas bar and restaurant. Patricia the owner of this property was a delight. She responds to e-mails very quickly and when we had a small problem with the pool she travelled from Madrid to ensure it was thoroughly sorted promptly. I highly recommend this property and is one of the few I would be keen to revisit another time. I'm very grateful for your nice review. It has been an honor hosting you. We are very happy you have enjoyed your stay. We are looking forward to seeing you in the future. This year marked our 8th year holidaying as a group (13) in Andalucía. We all agreed this was the best place we'd stayed. The house is massive, there was no point in which anyone got in anyone's else's way. Viznar had a couple of bars both serving food and drink until late - very good value also. Thank you very much for your time and for your useful review. With regard to the deposit, I should have mentioned that any other legal currency it is admitted. I'm very sorry about the inconveniences. The villa is located in Viznar, in an excellent natural setting in the Natural Park of Sierra de Huetor. 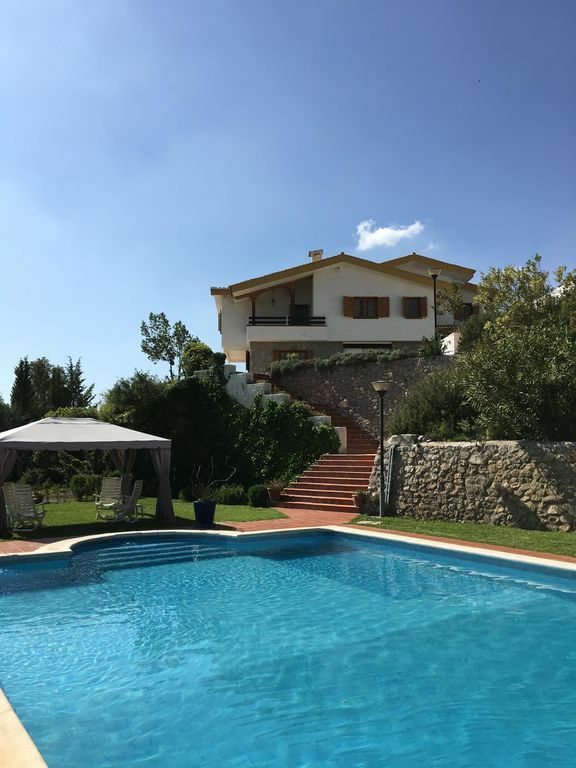 The property itself is on a hillside with excellent views of the Parque Natural de Sierra Nevada and the Sierra de Huetor, at only 500 m from the village downtown where you can find all necessary services. The location is perfect for outdoor activities including walking, climbing and mountain biking. The Villa is located at only 10 minutes (6 km) from Granada, the city of The Alhambra, one of the most visited monuments in Spain. The skiing areas of Sierra Nevada are about 1 hour (58 km), and about 1 hour from the nearest beach at the coastal town of Salobreña or Motril (85 km). Ski: The skiing areas of Sierra Nevada are about 1 hour (58 km). Please ask for discount information for stays longer than 2 nights. We ask for a deposit of 50% of the total payment, with a minimum of 600€. The deposit will be returned after inventory. When booking you have to pay 50% in advance by bank wire transfer. Up to 15 days prior arrival is the final payment.